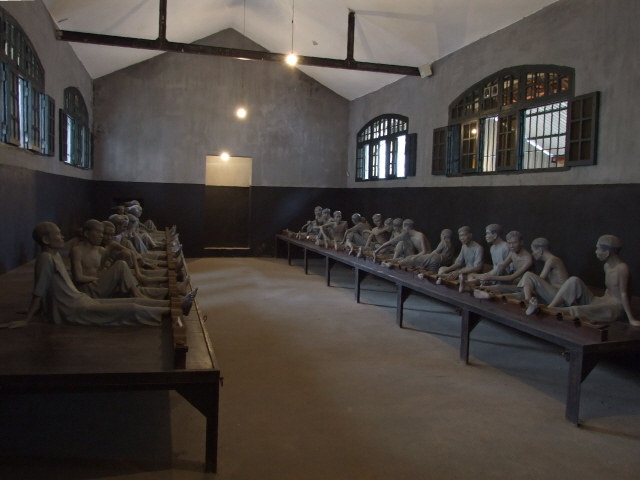 A former prison in Hanoi, Vietnam, originally built by the French in colonial times, primarily for incarcerating political prisoners. Later, during the Vietnam War, the prison was one of the places where the North Vietnamese detained shot-down American pilots, who sarcastically nicknamed the place "Hanoi Hilton". More background info: When the French first built this prison in 1896, they moved/destroyed an entire village known for its quality crafts to make space for this stone edifice. So here the dark legacy already begins. 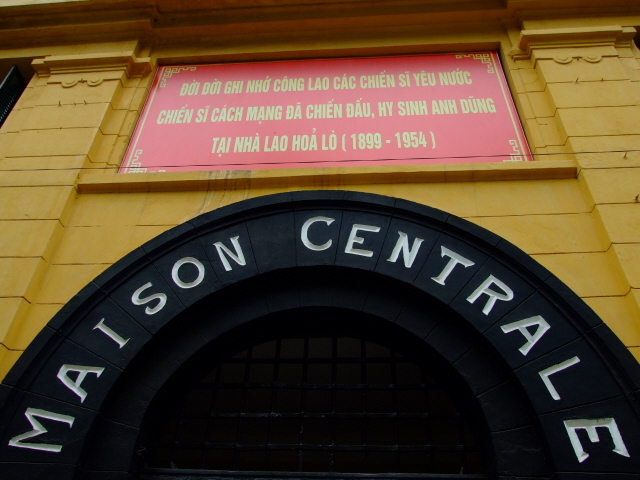 In the decades until Vietnam's independence, the French colonial powers used the prison, then called "Maison Centrale", mainly to hold political prisoners. It was intended to house a prison population of no more than 450, but by the time France's grip on its Indochine colony was collapsing in the first half of the 1950s, more than 2000 prisoners were crammed in here. Conditions were predictably not good, and brutality the norm. During the Vietnam War, the prison was one of the detention centres for US pilots who had been captured after having been shot down over North Vietnam. Treatment of the POWs was apparently pretty bad too, including torture in order to get prisoners to make statements in which they criticized the USA and praised the North Vietnamese. Early in those tough years, the inmates nicknamed the place "Hanoi Hilton" – at least they hadn't lost their sense of sarcastic humour! Conditions later improved from late 1969 onwards. Of course, the Vietnamese have officially always claimed that POWs were never subjected to such things as torture and were treated well. The American ex-POWs reported otherwise back home. 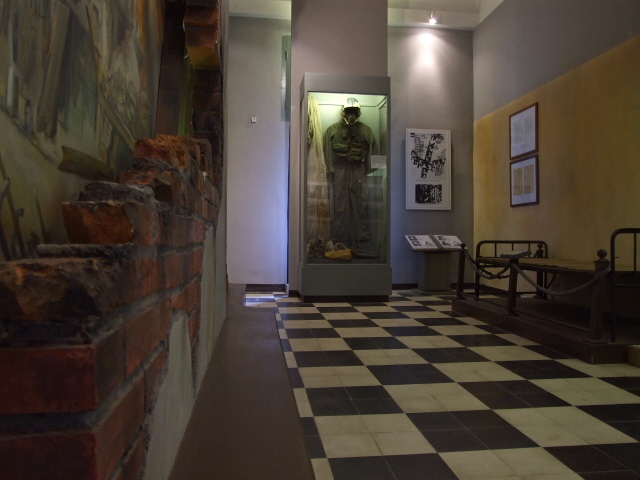 The most famous inmates in Hoa Lo included Douglas 'Pete' Peterson and John McCain. The former later returned to Vietnam to become the first US ambassador to the country after diplomatic relations had been re-established in the mid 1990s. The latter famously ran for president in 2008, losing to Barack Obama. McCain also published a book about his experiences in Vietnam, in particular including his five years as a POW, part of which he spent in the "Hanoi Hilton". 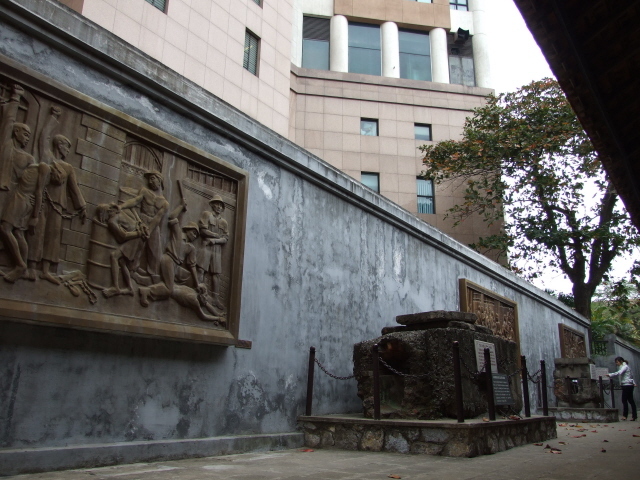 Much of the prison building was demolished in 1993 to make way for a new high-rise building project, but one wing was preserved and today houses the Hoa Lo Prison Museum. What there is to see: The museum is divided into several sections, relating to different periods in the site's history. Starting in the wing to the east of the main entrance (the outside of which still bears the original French name of the prison: "Maison Centrale"), you first get to a small section about the village that had to make way for the prison. The next couple of sections cover prison life and French colonial brutality, leading on into a room with a couple of dozen dummies of shackled-together prisoners. 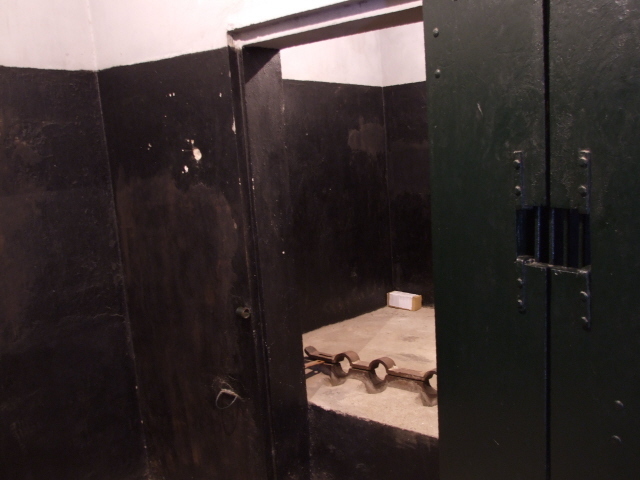 Beyond that you can peek into a few small solitary confinement cells, one complete with a shackled dummy. You then go outside and walk along the narrow courtyard along the wall to the western wing, passing en route several graphic reliefs depicting brutal prison scenes and also two artefacts salvaged from the demolished part of the former prison: small sections of the sewers through which prisoners managed to escape in 1945 and 1951, respectively. In the western wing, more prison cells are to be seen, as well as (rather crude) depictions of French colonial dummies beating patriotic Vietnamese prisoner dummies, who defiantly hold up their revolutionary fists. Some sections in the next part of the museum go a bit off topic in that they rather relate to the independence struggle in Vietnam and support for the cause abroad. A particularly interesting section is of course that about the American POWs. As you may guess, things get ever so slightly tilted, historically, here. First there are pictures and artefacts about the shooting down of American planes, including John McCain's pilot suit and parachute. The museum also has a photo of the real McCain taken when he visited the museum in the year 2000! The section about the treatment of American POWs in the prison is likely to be received most controversially – the museum makes out that the POWs had a whale of a time here. Pictures show them smiling, while playing chess, cultivating plants in the courtyard, enjoying the cinema, playing guitar, and so on. It is of course to be expected that the museum would push the Vietnamese version of the story, but they push it a little too much, I would reckon especially for American visitors. What takes the biscuit is the statement to the effect that the prisoners referred to the prison as the "Hanoi Hilton" because they thought it was almost as comfortable as a hotel. Now that's some twisting (or maybe lack of understanding sarcastic humour?). Anyway, it is most interesting to see these … as long as you don't buy it at face value, of course! Upstairs are a few more rooms, but here the theme gets particularly pompously revolutionary and to get something out of this you really have to be very much into the nitty-gritty of Vietnam's communist history and personnel (mostly unknown to me I am happy enough to admit). I got bored pretty quickly and skipped much of this. It just couldn't compete with the cooler parts of this partly dark, partly weird museum. Explanatory text panels and labels all have English translations these days, though the quality is sometimes not of the very highest order and stylistically a bit off the mark here and there, but it does get the information across more or less alright. Location: on the street of the same name, which connects the long avenues of Hai Ba Trung and Ly Thuong Kiet, in the southern part of central Hanoi, on the western edge of the French Quarter. Access and costs: easy to get to and cheap. Details: to get there you can walk it from the city centre. In fact it's in the city centre, just a couple of blocks south-west of the central Hoan Kiem Lake, and right on the edge of Hanoi's French Quarter. The address is basically the same as its name: 1 Hoa Lo Street. Opening times: daily, except Mondays, between 8 and 11 a.m. and 1:30 and 4:30 p.m.; admission: something like 5000 Dong (i.e. the equivalent of a few cents). Time required: anything between half an hour and two hours plus – depending on how deep you want to delve into everything the museum has to offer. Some sections, however, can really quite easily be skipped or skimmed, so that about an hour should be a reasonable estimate of time to be allocated to Hoa Lo. Combinations with other dark destinations: see Hanoi.